Nine years before British screenwriter Lord Julian Fellowes created the smash hit television series Downton Abbey for ITV Studios concerning Britain’s aristocracy in the early 1900s, he copped an Oscar for Best Original Screenplay for director Robert Altman’s Agatha Christie inspired ensemble cast whodunit Gosford Park. Set in the early 1930s on the estate of Gosford Park managed by Sir William McCordle (Michael Gambon) with his wife Lady Sylvia (Kristin Scott Thomas), the two wind up hosting a weekend shooting party inviting a large group of friends including but not limited to members of the aristocracy as well as a Hollywood film producer with his valet. The tranquil and carefree get together is soon turned upside down when Sir William turns up dead and everyone becomes a suspect ala And Then There Were None or Murder by Death. In typical Altman fashion, however, the murder is secondary to Altman’s real interests which zero in on the interactions, machinations and social hierarchy of the household. As with Nashville and Short Cuts, the film sports an eclectic cast of over thirty characters, cross-cutting freely between their mutual interlocking stories with a clear separation between the upstairs wealthy elites and the downstairs servants working the kitchens, laundry and shoe/cutlery polishing. Sporting key cast members who would inevitably show up later in Fellowes’ Downton Abbey including but not limited to Maggie Smith as the Countess of Trentham and Jeremy Swift playing a servant in both properties, the film boasts Kelly Macdonald, Camilla Rutherford, Charles Dance, Tom Hollander, Bob Balaban, Ryan Phillippe, Helen Mirren, Clive Owen, Alan Bates, Emily Watson, Derek Jacobi and Stephen Fry among others. The wide-ranging cast of characters, in the time honored tradition of its director, aren’t always easy to keep up with as Altman’s trademark use of overlapping dialogue can become disorienting on the viewer. The film also sports the director’s constantly moving camera and frequent use of the telephoto shot seen in nearly all of his works. 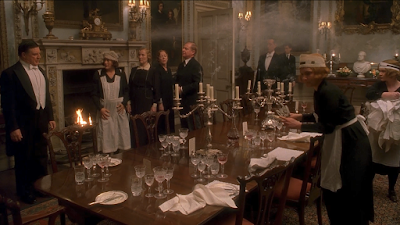 Altman has always dabbled in ensemble pieces peppered with interlocking story arcs which weave in and out of each other, but Gosford Park represents the late American auteur’s first foray outside of his element by setting the story in a British period piece. Watching Altman’s film, one gets the sense most of iconography and structure fans of Downton Abbey are familiar with already had its tracks laid nine years prior. Aside from Altman’s uncompromising audiovisual storytelling technique and the Agatha Christie inspired murder mystery, much of what appears onscreen clearly paved the way for what would or would not become the hit ITV television series. The film is also consistently darkly humorous with some moments coming across as more meta than others such as Helen Mirren playing opposite a misogynistic Michael Gambon once again (see The Cook, the Thief, His Wife & Her Lover). 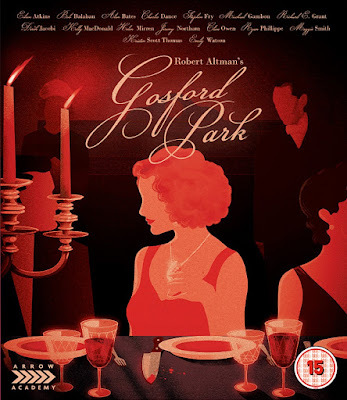 Gosford Park of course looks and sounds lovely thanks to Threads and The Madness of King George director of photography Andrew Dunn and a moody period score by Patrick Doyle, creating ample room for the viewer to lose themselves in the world of Altman and Fellowes’ creating. Upon release, Gosford Park was nominated for the Best Picture Academy Award and became both a critical and commercial success, making it Altman’s most profitable film since his 1970 Best Picture winner M*A*S*H. The film also took home the Best British Film Academy Award and Best Costume Design. As an entry into Altman’s canon, it has only grown better with age and seeing it in light of Fellowes’ hit TV show illustrates the blueprints drawn up by both creative visionaries. Incidentally, Downton Abbey was originally intended to be a loose sequel/spinoff of Gosford Park but over time evolved into its own television series set three decades prior. 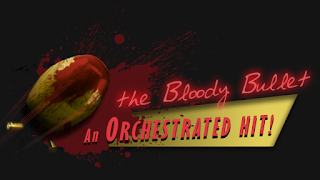 Fans of the show with the clear cut episodic form unaccustomed to Altman’s film are in for both a surprise and a challenge as the territory viewers are immersed into seems familiar but with an often jagged narrative language and structure that is unmistakably that of a master filmmaker at the peak of his creative powers.